You certainly know that visual inspection is an integral part of regular garage door maintenance. It helps you to identify damaged, worn and broken parts. However, there is an easier way to spot existing problems early on. You simply need to listen to your automatic door. Where Does that Scraping Sound Come from? This noise is usually made by the lift cables when they are worn. While they help to pull the door up during opening and then get wrapped around the drums during closing, they can produce truly horrible sounds. You need to check them briefly to confirm that they are responsible for the noise. You will discover fraying which will be more than obvious. Frayed cables require timely replacement. Otherwise, they will break and leave the door jammed. The unit may even go off track and make the problem even worse. The important thing to note here is that these components don’t usually get worn at the same rate. If one of the cables is frayed and the other one is intact, then the latter doesn’t have to be replaced. When you use our services of Garage Door Repair in Stamford, you will get the most effective solution. Can anything be done to reduce the rate of wearing of lift cables? They are not supposed to be lubricated. That is why the only thing left is regular inspection. Why Do I Hear Ever Louder Squeaks and Popping Sounds? The hinges make squeaky sounds when they become worn. Check the cylinders to determine if they are oval. If this is the case, the components should be replaced. If the cylinders are perfectly round, lubrication should solve the problem. Use lubricant whose texture won’t change as the temperature drops during the winter months. A lithium-based product should do a great job. You can find such a lubricant in practically every store in Connecticut. 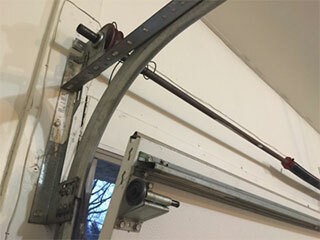 When the metal rollers of a garage door are worn, they produce popping sounds. Lubrication is a temporary solution and not a particularly effective one in general. Replacement is the only permanent solution. You can opt for traditional steel rollers or for nylon ones. The latter actually have nylon wheels and steel stems. They are quieter than their counterparts and don’t require lubrication maintenance. At the same time, the steel rollers are known to be more durable. You get to decide which option will be better for you. You should consider the size and weight of your door and the type of opener which you have.